The '89-93 Rams need more fuel and more boost to make good power. TST recommends a 16 cm2 turbine housings where stock is either 18 or 21 cm2, this turns boost up 5-10 psi over stock. TST boost and pyrometer gauges also work on pre'94's. Boost alone doesn't help much unless you also turn up fuel flow. The Bosch VE pump can be turned up by turning the power adjustment screw clockwise about 1 to 2 turns. This power adjustment screw is located on the firewall end of the injection pump under a plastic cover that will pop off. There is a jamnut that must be loosened and a steel collar tack welded on this screw which must be removed to allow much power increase. 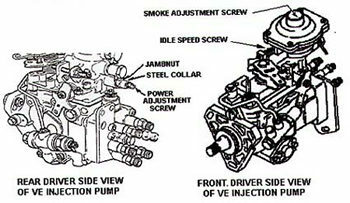 There is no need to remove injection pump from engine to perform these adjustments. Once you turn up the fuel, you will likely need to adjust the idle linkage to turn idle speed down. You may also need to readjust smoke by adjusting tension on the boost diaphragm spring. Spring tension is adjusted by turning the smoke adjustment screw, which is located under a small round cover plate on the top of the injection pump. This cover plate is simply pressed into place and can be removed with a small screw driver or knife blade. If you cannot adjust the idle down to the desired speed, or the smoke to the desired smoke level, then you may have to turn the power adjustment screw counter clockwise to achieve the desired result. On a very few engines turning the power adjustment screw clockwise will not turn up the power. On these engines the injector nozzles must also be replaced with higher flow nozzles in order to increase power.